Steel members used as temporary supports for buildings in danger of structural damage. As in old building adjacent to new construction work. 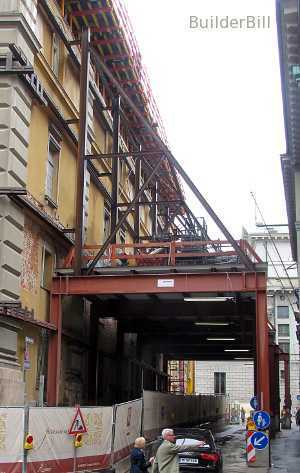 A framework on heavy legs to carry building equipment, a working platform, a crane or other equipment while often allowing free passage of pedestrians or vehicles underneath. Steel Shoring : A steel gantry supporting steel raking shores. The photograph above was taken in Munich, Germany, and it is fairly typical of the problems facing modern builders in old city centres. 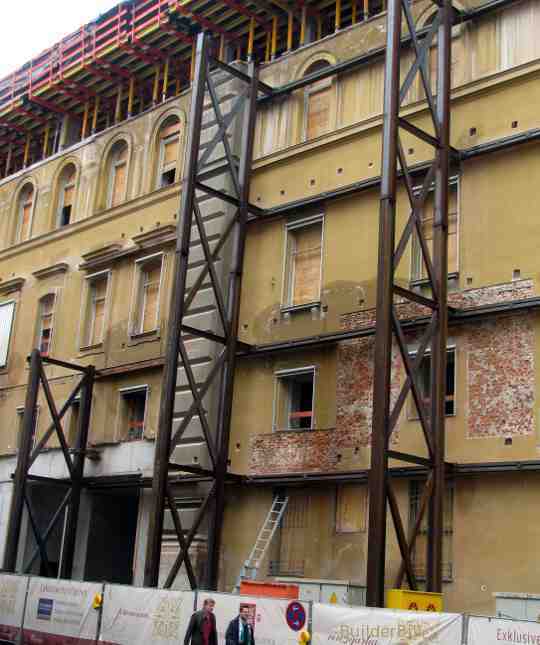 The old building facade requires supporting while it is renovated and added to. The use of timber is still common on work like this but it is relegated to providing shorter members bracing window openings, and also as pads between the steel and the masonry to provide an amount of "give" to the connection. See the steel flying shores here. Gantries are structures that provide a platform. Most often they are seen in inner city area where space on a construction site is at a premium, No room to put site offices etc. So they are placed above ground, often over footpaths. They are made out of beefed up external scaffolding. Other gantries fall into the category of permanent structures, such as gantry cranes, gantries over motorways carrying signage etc. Here is a photo of the same building on another street frontage. This time the engineers have made up temporary structural steel shoring out of vertical frames to support the old building. The connection of the base of theses steel soldiers would be critical. I doubt if they are just sat there, they would be bolted to concrete pad footing at least. A close up of the previous photo showing the connection to the wall via walers (horizontal members).